Throughout much of the 19th century, equestrian organizations called Jockey Clubs sprang up across the world. These groups tasked themselves with the regulation of professional horse-racing on a national scale, establishing criteria that directly affected the administration of the sport. Jockey Clubs originally founded everything from breeding standards to competition bylaws. And while governmental agencies have assumed the responsibility for supervising horse-racing in recent years, the guidelines that the clubs first created still exist in some form today. It is in large thanks to these organizations that modern equestrianism has a glorious reputation. Yet, the groups also doubled as a place where members of high-society could gather. In France, the Jockey Club de Paris was the choice organization for the country’s social elite who were heavily invested in horse-racing. Founded during the 1830s, this social club quickly emerged as a dominant cultural force in the French capital. It bounced around numerous homes throughout the city a ceaseless pursuit for a venue that would appropriately reflect the grandeur of its members. After a long search, the Jockey Club de Paris eventually settled on a gorgeous hotel called the “Hôtel Scribe” in 1863. Finished some two years prior to the arrival of the Jockey Club de Paris, the Hôtel Scribe was one of the many creations of the famed French civil engineer, Georges-Eugéne Haussmann. Developed to help enhance the opulence of Paris’s new Opera District, the building quickly emerged as one of the city’s most prestigious hotels. But when the Jockey Club de Paris decided to use the first two floors of the location as their headquarters, the Hôtel Scribe’s reputation was catapulted to new heights. The hotel soon became closely associated with its luxurious tenants, creating a sophisticated charm that impressed its many visitors. 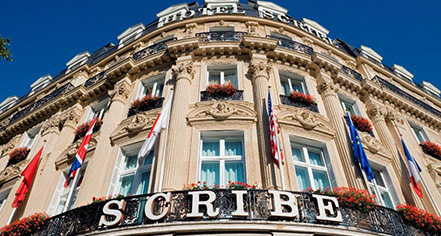 By the turn of the century, the Hôtel Scribe was among the most recognizable structures in Paris’s 9th arrondissement. The Hôtel Scribe successfully maintained its revered status even after the Jockey Club de Paris decided to relocate to its present address in 1925. Countless travelers remained fascinated by the hotel’s alluring character, arriving in droves to experience its legendary accommodations. Well-known international celebrities soon began to arrive at the Hôtel Scribe as well, transforming the location into a regular haunt for famous artists, intellectuals, and entertainers. Legendary figures like Marcel Proust, Jules Vern, and Sergei Diaghilev have all resided at the hotel at one point or another during its venerable history. The Hôtel Scribe even served as the Parisian residence for the iconic French actress, Josephine Baker! Sofitel now proudly manages this fabulous historical building as the Hôtel Scribe Paris Opéra in honor of its storied legacy. Currently under renovation, Sofitel’s efforts to modernize the hotel will help preserve its past for future generations to appreciate. The preeminent French interior designer Jacques Grange has endeavored to ensure that his imaginative vision for the building will respect its glorious heritage. His daring plan seeks to commemorate a unique aspect of the hotel’s rich heritage on each floor, immersing guests wonderfully into the history of the Hôtel Scribe Paris Opéra. Be sure to visit this stunning French landmark when the restoration concludes in 2019! 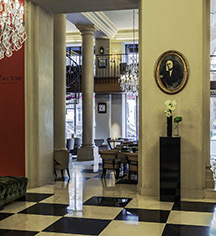 Hôtel Scribe Paris Opéra, a member of Historic Hotels Worldwide since 2018, dates back to 1861.